Editor’s Note: Sun Yung Shin‘s second collection of poems, Rough, and Savage, was published last month by Coffee House Press, who also published her first collection, Skirt Full of Black, in 2006. Sun Yung was kind enough to answer a few questions about her work and process. Timothy’s thoughts on Rough, and Savage appeared yesterday in the What We’re Reading column. Timothy: I was struck by your use of academic research to craft the poems in both Rough, and Savage and your first collection, Skirt Full of Black. Can you talk a little about research as it relates to the process of writing your poems? How do you integrate found text with your own? Sun Yung Shin: It’s an approach I first learned from the labor poet Mark Nowak, who has been focusing on the cost of the coal industry on its workers, here and in China. His latest book is Coal Mountain Elementary, also from Coffee House Press. 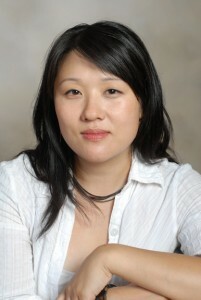 I also have learned a lot from the work of Korean-American poet Myung Mi Kim, who teaches at SUNY Buffalo. Research, or really I would just call it reading, is important to me because I see writing as inherently collective and I try to foreground that in a lot of my work, for a variety of reasons. As far as integrating other text, I would say that the integration is really a conversation or dialectic between myself and the text, or between a multiplicity of voices I might attempt to bring into the forum on the page. The original text is often a place where I start; it might be something that I’ve read as an adult or something that has lived within me since childhood, such as a fairytale. Could you say more about what you were struck by? T: I think what struck me was how far outside the traditional lyric academic research seems to me. Your method seems to be a balancing act between Wordsworth’s “spontaneous overflow of powerful feelings” and the more rational examination of fact. Is this tension—if tension is the right word for it—something you’re conscious of? SYS: Tension is a nice word for that. I think so. I’ve always been kind of cerebral and analytical, but not very linear or logical, I’m very associative, so I think it—the inclusion of fact—just comes naturally. And, a part of my longer-term project as a writer is to continue to exorcise the male, pseudo-objective, pseudo-scientific voice from so much of what I consume, just as an American in daily life, let alone as a reader and writer. That comes from a very deep emotional well of feeling subjugated, silenced, of living in a society in which almost always what is male and what is white valorized, normalized, made heroic, made interesting. So there’s a real violence, a purging, going on as well. It’s sort of like being in a kind of hell and trying to navigate through it without being burned continually. Mythic language, also a language of reterritorialization, is involved in the spiritual and the religious. I think for me, the emotion often gets expressed through mythic language, through working with archetypes. T: Many of these poems are set in contemporary Korea, but many also hearken to a pre-colonial Korea as well. Aside from your role as poet, do you see your role as primarily an ambassador, documentarian, historian, or some combination of those, or as something else? SYS: I don’t really see my role as any of those things, although a poet may of course embrace many of the tasks or opportunities of the roles you mention. I see part of the project of the book as being a way to enter into the beginning of human inhabitance on the peninsula…the colonial period was really so short and in the 20th-century and Koreans have been on the peninsula for thousands of years, so I would probably frame anything before 1910 as the dynastic period, pre-dynastic, etc. Does that answer your question? The question of the role of the poet, or how I see my role as a poet, is so huge I’m not quite sure how to begin without launching into a gigantic poetics digression! T: At the risk of sounding ignorant, I suppose I’m thinking of a reader like myself whose knowledge of Korean history and culture is fuzzy at best. If you’re using the poems as an entrance to the beginning of Korean history, then I found myself following behind, entering Korea through your poems in a way that is obviously much different than your experience. I suppose my question is more about the way these poems serve as a guide, a Virgil, through a time and space I don’t know much about. Do you have the, let’s say uninformed, reader in mind when you’re writing? SYS: Well, I think I actually have myself as a reader in mind for the first draft—like a lot of writers I think I write what I need to read, what I think hasn’t been written. But, that said, I do think of outside readers because I do want to communicate, and engage in a conversation, or bring something useful (or canny, or hallucinatory) to others. I am trying to invite others into an experience, a question. So to answer your question, I think a person wouldn’t need to really know anything about Korea or Korean history. I think its history is part of a much larger human history of going from hunters and gatherers to clans to countries. And that history becomes riddled with war once metal was discovered and once trade was created. Then wealth was created, then striations appeared in societies, then contests over space and resources intensified. And our morality has continued to develop. And is still very much developing. It often feels that our morality as a species is quite primitive. It seems like we’re waking up to some new things as a group, though—such as factory farming being a disgrace, being torture. That’s something that I woke up to in high school and wasn’t sure if I’d ever see become part of a mainstream discussion in this country. But here it is. Due to years of activism by others. However, I do want to learn more history of my ancestors and I do want Americans to consider U.S. foreign relations in Asia and what all of our complicities may be, wherever the U.S. puts its foot down. It’s not that whatever the U.S. does is bad, and I hold so many things that we value as a people sacred (the First Amendment, for example) it’s just that the mainstream media, even public media, does not really go deeply into the impact on the people being occupied (militarily, economically, etc.) by the U.S. and other wealthy nations. T: It seems to me that the fractured and layered nature of the poems parallels the fragmented history of Korea. This is especially apparent in poems like, “REDACTION: United States Central Intelligence Agency | The World Factbook | East & Southeast Asia :: Korea, South” and its sibling, “REDACTION: United States Central Intelligence Agency | The World Factbook | East & Southeast Asia :: Korea, North.” How does form and content interact? How conscious of this are you as you’re composing? SYS: I’d say that I’m quite conscious of form/content when I’m composing, although first-draft writings are very intuitive or trance-like. To me, these poems are not fractured and the history of Korea is not fragmented. I would say that these poems are trying to highlight in/visibilities and erasures. Fragments mean pieces broken off a whole, and that’s not how I see these poems, but I can understand that type of reading or framing. I would describe Korea as divided (as opposed to unified). Fragments are generally not re-integrated into an organic whole—they might be foreign objects (e.g. shrapnel fragments…). But again, it’s easy to use those kinds of terms when considering Korea’s ongoing proxy / civil war. T: I like the idea of erasure and visibility rather than fractured or divided. I was thinking of the gaps, especially in the two poems I mentioned, when I wrote fragmented. Are these poems, then, a way to try to reunite or expose? SYS: Reunite or expose is a great way to put it. I was on a panel called Poetic Witness last night and Ed Bok Lee, who was also on the panel, said that he feels his job as a poet is to make the invisible visible, and the visible invisible. In those two poems I wanted to strange-ify these very strange documents—these Central Intelligence Agency dictionary entries. The sense of scale—two countries formerly one country—encapsulated into these two little blocks of text, written by some nameless analyst or technical writer or historian for the CIA. Surreal. How does one reconcile that with the living, breathing Koreas? And then visible white space in a poem is often a signifier of what is not being said, what is not told or exposed. T: As an adoptee you’ve been very active in working for adoptee rights and the rights of parents who put their children up for adoption. You’ve also worked toward building community for adoptees within the larger community. Does Rough, and Savage add to the conversation about adoption and racism in Western culture? How so? SYS: Thank you, but actually, I haven’t been all that active in the adoption realm. I did co-edit an anthology on the topic and have had many occasions to speak about adoption, but I don’t engage in much direct activism in the adoptee world, especially these days. I have been working on a media advisory regarding reporting on adoption. My co-editor Jane Jeong Trenka is doing tremendous public policy work with her organization TRACK in Korea. And many others are doing important work, for example organizations such as AKConnection and AdopSource right here in Minnesota. I did not grow up in Minnesota so it’s been a surprise and a marvel to witness the flourishing of all of this adoptee-led scholarship, social services work, art, and community building. T: The title Rough, and Savage comes from Robert Pinsky’s verse translation of Dante’s Inferno, and each section of the collection features a quote from Pinsky. What drew you to Dante’s text and specifically to Pinsky’s translation when you were working on these poems? How familiar should the reader be with the structure and plot of The Inferno? SYS: Pinsky’s translation is what critics call muscular—it’s very rhythmic and non-fussy, which really appealed to my sensibilities. I think he really exploits the resources of the English language with its Latinate and Anglo-Saxon wellsprings. It felt fresh and conveys the story as an urgent and also bewildering vision quest. The aspect of dual worlds (pagan/epic/Virgil and Catholic/medieval/Dante) coming together in these nine circles within the earth is so intriguing. T: What other contemporary poets are you reading? What other writing and art is inspiring or obsessing you right now? SYS: I’ve been reading a Korean poet Kim Hye-soon and her translator, an American poet Don Mee Choi. I also just bought a copy of Road-side Dog by Czesław Miłosz. I’ve just taught The Metamorphosis for the umpteenth time and became obsessed with it all over again. I just ordered Deleuze and Guattari’s books Kafka: Toward a Minor Literature and Difference and Repetition so I can further my obsession. This weekend I watched Mother by the Korean writer/director Bong Joon-ho—and I highly recommend it. If you take three of his movies, Memories of a Murder, The Host, and Mother, together you have a very revealing glimpse of contemporary Korea.